Filter cages to suit Donaldson DCE DLM / Dalamatic Reverse Jet Filters. Made of mild steel, black epoxy powder coated to Interpon 700 EN131E standard. 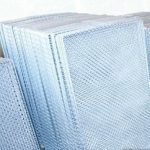 Quality filter cages are important to support your filter bags and to ensure the smooth and efficient running of your filter unit. This range of flat bag filter cages are compatible with most Donaldson DCE DLM Dalmatic Reverse Jet Filter units. These filter cages can be purchased individually or in bulk; there are no minimum orders. They come with black epoxy powder coating to Interpon 700 EN131E standard. There are four sizes available to order, to suit a wide range of Donaldson DCE DLM Dalamatic Reverse Jet Filter units. Please allow 5-7 working days for delivery of your new filter cages. Do you need help selecting the right size for your model? Give us a ring on 0845 519 8599. There are four different sized flat filter cages to choose from. Once you’ve determined the length your unit requires, select your option below. There is no minimum order, so you can buy a single filter cage, or purchase in bulk. Filter inserts to suit Donaldson DCE UMA / Unimaster Shaker Filters. Made of mild steel pre-galvanised wire. Allow 2 to 3 days lead time.